St. Augustine grass is adapted to moist, coastal areas with mild winter temperatures like the southern U.S. It is known to be tolerant of high summer temperatures, and St. Augustine grass retains its color at temperatures as much as 10° lower than those which discolor bermuda grass. St. Augustine grass tolerates moderate shade, being as good or better than other warm season grasses for shaded sites. 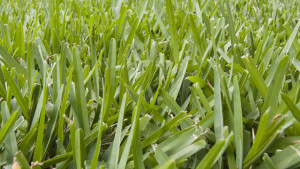 St Augustine grass is one of the most popular lawn varieties across the Gulf Coast. You can learn more about shipping directly to your site on our Ordering & Delivery Page. So long as fertility and drainage are adequate, St. Augustine grass tolerates a wide range of soil types. St Augustine grass grows satisfactorily at a pH range from 5.0 to 8.5, but develops a chlorotic appearance in highly alkaline soils (above pH 7.5). It does not tolerate compacted or waterlogged soil conditions. St. Augustine grass is highly tolerant of soil salinity, producing satisfactory growth at salt levels as high as 16 mmhos. Bermuda grass will tolerate only slightly higher salt levels. St. Augustine grass produces a thick, lush, dark green turf that is highly preferred by homeowners. St Augustine grass is used primarily for lawns. It does not tolerate heavy athletic field traffic as well as some other warm season species. It produces satisfactory turf at moderate levels of maintenance, effectively competes with weeds and other grasses and has only a few serious pests. St Augustine grass is readily established from sod since the species is vigorous and spreads rapidly by creeping stolons. After establishment the success of St. Augustine grass as a lawn grass depends largely on management. Mowing, fertilization and supplemental watering are required to maintain a dense, green, weed-free turf of St Augustine grass. In coastal areas where rainfall is adequate, St Augustine grass will survive with little care. In inland areas, where rainfall is less dependable, close management of water is required to maintain a satisfactory lawn with St. Augustine grass. The growth rate of St. Augustine grass is dependent on temperature, moisture availability and nutrient availability. Any one of these factors can limit the rate of growth of this species. In the spring with mild daytime temperatures and cool night temperatures, St Augustine grass greens up, but makes little growth. As day and night temperatures increase during late spring and summer, the growth rate increases. Thus, an established turf of St Augustine grass may require mowing every 2 weeks in early spring and as often as every five days by late spring if nitrogen fertilizer is applied. During the fall, as temperatures cool, St. Augustine grass maintains its dark green color, but its growth rate declines sharply. Mowing frequency may be reduced to twice monthly during late fall and early winter. During the fall, mowing height should be raised about 1 inch to increase total leaf area of the turf. The increased leaf area will help the grass accumulate energy reserves to get through the winter. The greater leaf area will also help prevent weed invasion during the dormant season.